Since I only have a cup of MILO for breakfast, I tried to sleep my hunger away. Indeed it was successful but unfortunately I woke up just in time for lunch. So I have another hunger pains to get through. Anyway, I still think I am blessed. 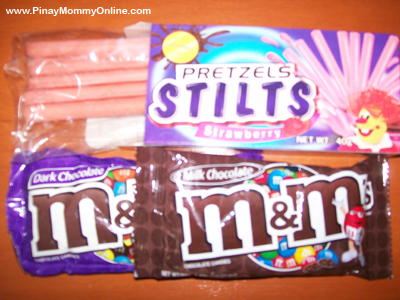 When I checked my bags, I saw two packs of M&M candies (sugar boost for energy) and Pretzels Stilts. Aside from that, I inquired about my EON account online and found a few hundred pesos left in it. So now, I can buy food to last me until Tuesday. Now I have only one problem left and that is a place to stay for Monday night! Oh well, I guess God will have something for me. All I need to do right now is just be glad that I am still alive and have candies for lunch. I am looking forward for a simple but hopefully a full dinner tonight!! And tomorrow, I will be out and I shall buy a boat ticket home. I can’t wait to see my kiddos again. I am hoping to find a safe place to stay at my friends home. I just need to thicken my face tomorrow when I asked. It would be better than staying at the streets and have a crank flashlight to give you light. By the way, I won’t deny the fact that I am still praying for a miracle to happen. I am still hoping that my hubby will look for me and say sorry but I think that would be impossible right now. Why? Because I went back to the boarding house just this morning because I forgot my laptop charger and I was able to grab his. Since it was not compatible, I was left with no choice but return there. When I arrived he was asleep, so I waked him up as I went out and told him “thank you and good bye.” Of course, what would I expect from a man who values his manly pride over his wife and family?? He didn’t say anything and he slept again. To save from further hurtful words and actions, I left his room. I will pray for you and I know you will be able to get through all these hardships because you sound like a really strong woman. Oh Ruby! As I read this post, I made a little back reading and I’m sorry that all your efforts has come to this. It is really only God who will be able to change your husband’s ways. I’m praying for you and know that His grace will be sufficient. hello timi! thanks for dropping by my blog often. i do appreciate it and hopefully i could return the favor once i get hold of my unlimited connection back. @ mommy jennie, i totally agree with you. i know GOD is the only resort to such problems and it’s the work of the Holy Spirit to convict him. i am just hoping someday God will bring about change within our lives. @ mommy dharlz, thanks for the advice. i will try to do it as soon as i am ready but for now. i am still in the stupidly hoping stage in life. Mommy Ruby i want to talk to you very important….Can i have your cel# so that i can call you? Ruby! This is MOmmy -G- from Paranaque… I just read your post now… PLEASE LET ME KNOW HOW I can get in touch with you. I’m buying you your ticket to Cagayan. You don’t deserve that. I’ve been through an emotional rollercoaster ride myself, but my husband and I are doing better now. From the last two posts… Naiinis ako sa asawa mo. And i don’t blame you for trying to work it out. PLEASE tell me how to get in touch with you. PLEASE! oh sweetie. May God bles you. You soun as if you have a warm heart. Best of luck! see, mommy? there are so many people who love you and wish you well. cheer up! we both have a lot to be grateful for. luv yah!